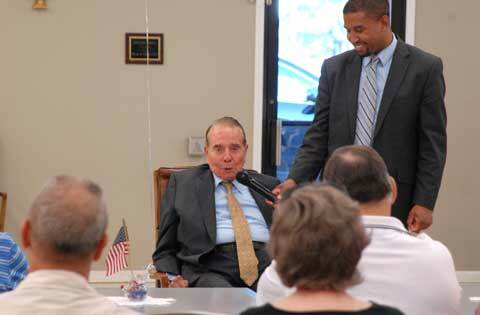 Retired U.S. Sen. Bob Dole delighted a crowd at Osage County Senior Center Tuesday evening with his wit and humor mixed with frank comments about his years of service as a U.S. senator and representative, and the current state of government. Assisting the elder statesman, who will turn 91 next Tuesday, with the microphone is Kirkland Hinds, of Dole’s staff. After taking questions from the audience, Dole offered to sit for photos with anyone who wished to, quipping that photos would be $100 each. Local World War II veterans were asked to be first to be photographed with the senator. Below, from left, Grace Jordan, Raymond “Lefty” Stephenson, Dole, and Dean Gardner. 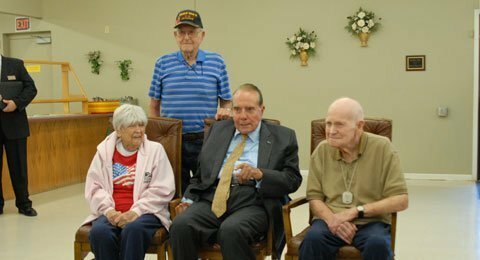 Dole visited Osage City as his fifth and last stop Tuesday, also ending his sixth recent tour of the state. 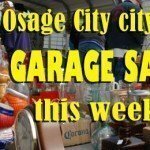 Dole’s staff reported that Osage City’s crowd of well-wishers was the biggest turnout of the day’s stops. See related article. 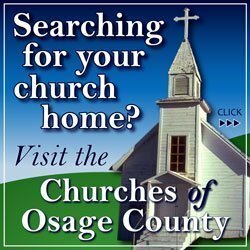 Refreshments were served afterward by the Osage County Republican Women. 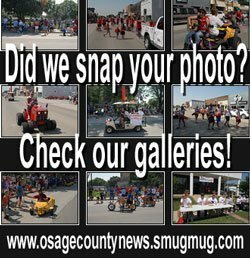 Photos by Osage County News of the gathering and local folks greeting Dole are available here.